In a hurry to play flight sim games the way they are meant to be? We can't blame you! That's why we have his Ready to Fly bundle, so you can buy a Playseat® Air force and a flight simulator controller, with a discount of 10%! Don't wait any longer and order the bundle, so you can start playing like a pro. This bundle includes a Playseat® Air force and a flight simulator controller of your choice. Read about the gaming chair and flight stick below. The sky is the limit with the Playseat® Air Force! This chair is used by flight simulator enthusiasts and for training by professional pilots. It has an extra strong, lightweight, powder coated tubular steel frame with high-tension spring and wire system for the most intense flights. The high profile side bolsters are made of ultra high-density foam; fully upholstered in alcantara, with synthetic leather reinforcements in the high wearing areas. Superior build quality, stability and comfort make sure you can enjoy this chair for many years. Thanks to unique foldable design, the Air Force uses little space when not in use. To make your experience even more realistic, use Playseat® Air Force with a virtual reality headset, like Oculus Rift, PlayStation VR, HTC Vive or any other high quality VR set! It will enhance the realism of the flight or space sim you play tremendously, because you will be the pilot inside the craft, with an amazing view, no matter where you look. 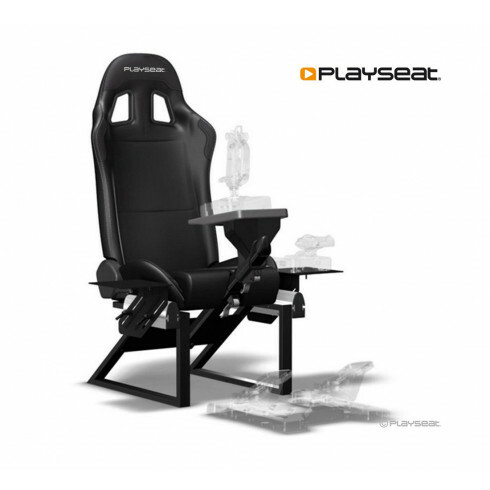 Playseat® is the essential accessory for the ultimate virtual reality experience! The Saitek X52 Pro is built to meet the demands of the best virtual pilots in the world! The LCD display is interactive. It shows important in-game information such as the Radio Stack and it interacts with your games directly. There’s also a Software Development Kit (SDK) included which allows budding programmers to create interactions with their own favorite games. The Saitek Yoke is highly engineered to meet the exacting needs of the true flight simulation enthusiast. Stainless steel shaft, ergonomic controls, integrated chronograph and separate throttle quadrant ensure a smooth, accurate and totally realistic flying experience. Thrustmaster presents: the U.S. Air Force A-10C attack aircraft HOTAS (Hands On Throttle And Stick) replica pack! With this pack you will experience what it is to be an Air Force pilot. It includes replica throttles, a replica control panel and a replica joystick! This is the stand-alone HOTAS Warthog joystick, from the creator of the original HOTAS (Hands On Throttle And Stick) concept and the worldwide benchmark flight sim controllers: the HOTAS Cougar and the HOTAS Warthog. With this joystick replica of the U.S. Air Force A-10C attack aircraft flight stick, you will know what it's be like to be an air force pilot. So take off and conquer the skies with the Thrustmaster HOTAS Warthog Flight Stick! Thrustmaster brings you the joystick with direct configuration for immediate takeoff and detachable throttle control: the T-Flight HOTAS X! This high-precision joystick with adjustable resistance is entirely Programmable PC and PS3! Thanks to the internal memory you can save all of your programming, even with the joystick disconnected. Thrustmaster brings you a fully programmable joystick for PC & PS3. The T-Flight Stick X is directly configured for instant take-off and is 100% PS3 and PC compatible! This joystick is extremely precise, with adjustable resistance control.